I really appreciate Gryphon House books. They offer quality teaching material to use, not just in classrooms, but in the home. Now, I know some people look at teaching tools and consider them meant just for classroom situations. I really don't. Anything that can be used in the classroom can be used by me as a parent to my child. Nothing prevents me from utlizing good resources to further my own child's education and understanding of the world around him. In my opinion, it's my responsibility to prepare him for life -- and learning. Therefore I'm quite willing to take a good look at what Gryphon House has to offer. 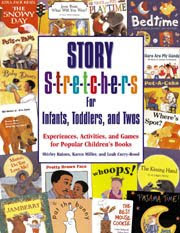 Story S-t-r-e-t-c-h-e-r-s kinda follows along the lines of Starting With Stories (click on the link to see my review) except for this book does not highlight lesson plan/activity ideas for multiple learning styles. This is a basic activity book for infants and toddlers that takes popular story books and builds on them. This is a book that you can start with at birth for good ideas on how to interact with your child as you introduce them to books and stories. For toddlers on up, I would probably go with Starting with Stories. However, if you are excited to introcude your child to reading and the love of it from a younger age, I'd go with Story Stretches for an earlier beginning. This sounds like a great addition to the library of a hands on family. Thank you for the review! How interesting, I think the idea for stretching a story out to meet more educational needs is a great idea. I think I have this book, but I haven't looked at it much. It sounds like I need to get it out and give it another glance! Hmmmm...unique idea I can really see the potential and use in something like this. Next to holding and cuddling a baby, reading to them is so exciting for both them and me. They get so excited, and I get lost in creating more excitement in reading to them. Once, our church babysitting tried to convince some twins to sit on the their laps. No go. So I started reading to the kids and had both boys on my lap--I had no idea they loved being read to. Such a delight!